Retail Price: $29.99 Log in for LOWEST PRICE! 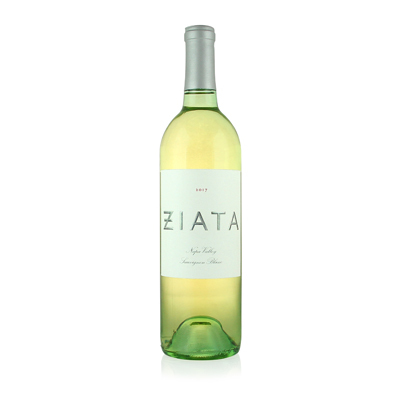 Ziata was launched in 2008 by Karen Cakebread and was named after her mother, Mary Annunziata. Karen was born in Palo Alto and spent many years in the tech business before founding her winery. Her goal was to make food-friendly wines, so she chose the friendliest of them all, Sauvignon Blanc and Pinot Noir. Almost everyone thinks of Napa Valley as Cabernet country, and for good reason. It is the pre-eminent grape here, as well as the most widely planted. But, many of us will mention Sauvignon Blanc in the same sentence, when discussing great wines from Napa Valley. Like most people here, Karen is involved in every facet of production, from sourcing the grapes, to harvesting and on to determining the final blend. Karen is also a realist, and realized that she wasn't a winemaker. So, she researched and dove into the selection process that netted her Jennifer Williams. Jennifer is a rising star in winemaking who had worked in several wineries in California and Spain and was ready to make the jump to the big time. Now on their twelfth harvest, we can taste Ziata's process. Each vintage was a learning experience, and Karen and Jennifer have learned it well. Our selection is about as good as Sauvignon Blanc can get, from one of the very best appellations. The dense, extracted nose of white nectarine and quince signal the significant flavor and finish to follow. It's spectacular at every turn.